Laval. Have you heard of it? Maybe you know it as the largest suburb of its famous big sister, Montreal, or for its technology and pharmaceutical sectors? Surrounded by the confluences of two rivers, the Rivière des Mille Îles and Rivière des Prairies, Laval is an island-city. Easily accessible by a half hour commuter train from Montreal, Laval is a great add-on to a Montreal weekend. With a plethora of its own unique adventures - and more affordable to boot - move over Montreal, Laval is ready for a coming out party of her own. Oh, and don’t worry about brushing up on your rusty French—English is widely spoken. Here are four can't-miss ways to play...amusez-vous bien! If, like R.Kelly, you “believe you can fly...believe you can touch the sky”, indoor skydiving, or body flight, is the activity for you. 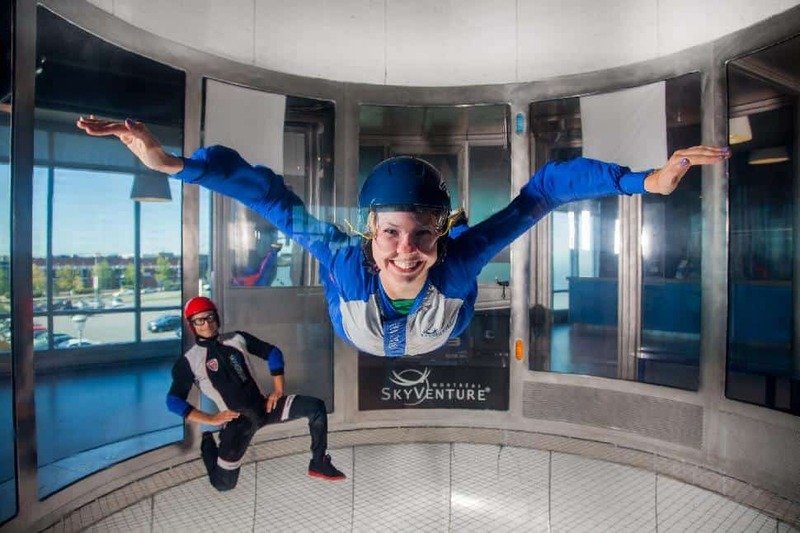 Open since 2009, SkyVenture is the first circulation wind tunnel to operate in Canada. The idea came from skydivers who wanted to train without planes. As the technology evolved, it became safe for the general public—so safe now, in fact, that the minimum age for this activity is four years old. The introductory package for $68 covers theory and two flights, but you’ll likely want to go for the “absolute package”, which gives you four flights. Always wanted to be a Sherlock Holmes, looking for clues to figure out whodunit? Book an escape game experience at Immersia, where you’re put in a room fitted and furnished according to the scenario, like "Weekend at the Shack" or "Piccadilly Cabaret". You and one to five of your family and friends are the main characters, and you must work as a team to solve the puzzles and escape from danger within the allotted time. If you’re the more competitive type, there’s also a scenario where you compete against each other to see who can solve the mystery first. Elementary, right dear Watson? Not quite. The room only has a 20% success rate for first time players, so you’ll have to put on your thinking cap, but oh, so much fun. The cost is $25-$28 per player for 60 minutes. Fun fact: Canadian Olympian Roseline Filion is one of the owners of this family-run business. At AeroSim you get to be pilot for an hour and operate an exact cockpit replica of a Boeing 757. Before take-off, a pilot instructor will provide a briefing, and family and friends can ride along for free in the cockpit to watch your inaugural flight. Choose from a number of airports to fly out of, like Dubai or Honolulu, and the amazingly life-like graphics will have you flying by the 160-story Burj Kalifa or gazing at the Diamond Head. If you want even more of a thrill, try flying an F-16 Fighting Falcon simulator where two people can fly side by side on a mission, as a team or against one other. Movement and audio are so life-like that you may want to take your motion sickness meds first; this experience is like a video game on steroids. Flight packages start at $99. AeroSim Experience is Canada’s first professional-level flight simulator for the general public, so you need to book well ahead to reserve your spot. Who needs to go to Hawaii, when you can ride the waves on a flowboard or bodyboard at indoor surfing centre, Maeva Surf? Whether you’re a novice or a pro, be ready for a workout, and ladies wear your one-piece, as those waves are strong! Plan this activity to coincide with lunch. The faux-beach setting, with palm trees and all, oozes “cool”, making it a fun place to kick back to watch the other surfers while you eat a naan pizza or tuna tataki and sip a blueberry mojito. Even better, plan your visit to coincide with the once a month DJ-in-the-lifeguard station party. Pre-lesson theory and 30 minutes on the waves with an expert trainer costs $50. The Hilton Montreal/Laval and the Sheraton Laval are located just minutes away from these attractions. Both are also next door to the super mall, Carrefour Laval. The Sheraton has the added bonus of a serene in-house spa called Amerispa. For a unique experience, visit House of Jazz, a two-story venue filled with bling, interesting art objects, and 120 extravagant chandeliers. Six days a week there are performances by jazz, blues, and R&B headliners that will keep your toes tapping. For an upscale Quebecois experience, try the award-winning Le Mitoyen Restaurant. It’s one of Quebec’s top restaurants, and it’s easy to see why. At Centropolis, a unique shopping and patio restaurant district, there are also lots of options, like Les Enfants Terribles, where they serve up comfort food dishes with a twist (this is a great place to get your poutine fix). The province of Quebec has more to offer than maple syrup and Francophone festivals - though it has that, too! You think you know Montreal? Do you know about our favourite, lesser-known gems?